A VERY GOOD REVOLUTIONARY WAR PERIOD SHORTLAND PATTERN/SECOND MDL. 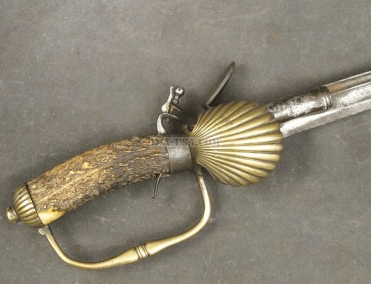 BROWN BESS BAYONET, ca. 1770s: In overall very good untouched condition. Regulation pattern, triangular form, tapered, flat blade with a bottom flute/blood-groove for its entire length and generally smooth, untouched, brown, surfaces with some light scattered pitting. Unmarked base with a very good, 16″ blade with its original tip. In overall very good untouched condition with a deep russet age-patina and generally smooth surfaces. Sharp contours, untouched brown surfaces and some expected pitting and patches of discoloration. Matching ringed socket with a “Z” lug aperture and smooth steel surfaces, en suite with the blade. 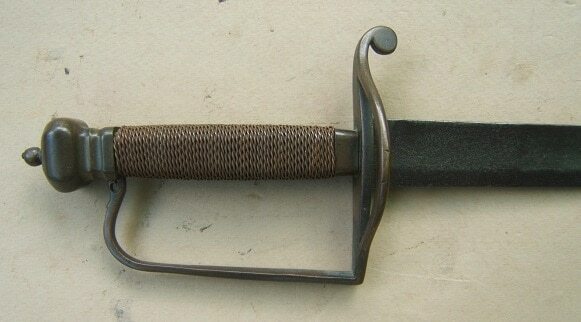 A nice untouched example of Revolutionary War Period Second Model Brown Bess Bayonet, ca. 1770s. Overall length, 20 1/2″.